KoopaTV: Money Is More Important Than Love: Splatoon 2 Splatfest! 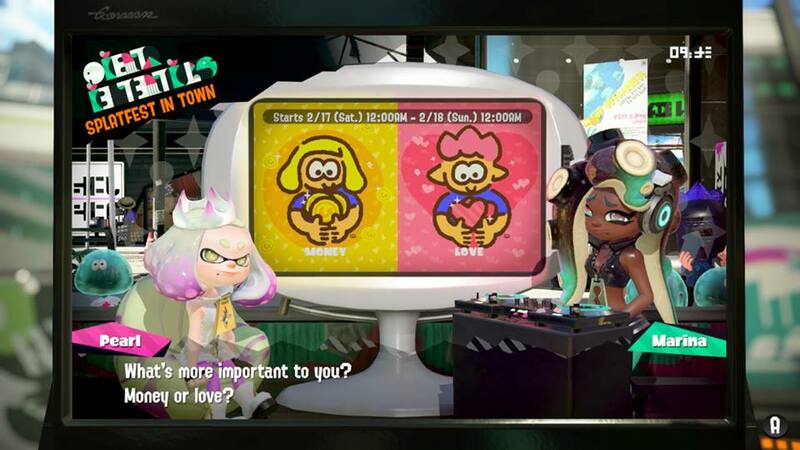 Money Is More Important Than Love: Splatoon 2 Splatfest! By LUDWIG VON KOOPA - The pro-Love, anti-Money team relies on tired canards. MONEY VS. LOVE! Which is more important to you? By the way, it occurs on Saturday, February 17 2018. 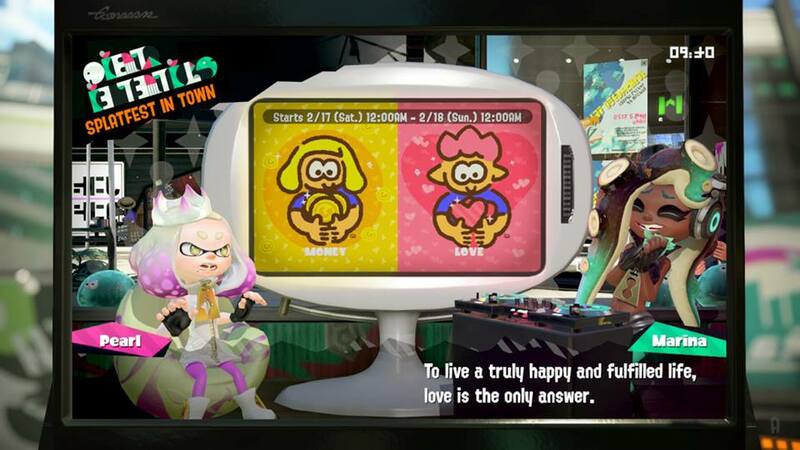 If you got your Splatfest information from certain non-KoopaTV places, you may recall that for Halloween 2015, in the original Splatoon, Japan had the exact same theme — though the graphics for money and love were different, and the order was Love vs. Money instead of Money vs. Love. Guess they wanted to go out of their way to make sure Callie and Marina got Team Love, while Marie and Pearl got Team Money. If it will affect your decision, let me tell you right now that Team Love managed to beat Team Money in that Splatfest. Money won the Popularity vote (with 53% vs. Love's 47%), but Love got more Wins with 51% to 49%. That said, this will be North America and not Japan (they have different value systems), and the scoring system for Splatoon and Splatoon 2's Splatfests are completely different. If you want to see Money vs. Love in the United States among Nintendo fans, then the most relevant poll is the Wii's Everybody Votes Channel poll conducted on August 2007. Love was deemed more important by 79.1% of respondents, with Money only getting 20.9%. That was right before the Great Recession, so maybe Money got a dramatic buff in the decade since. As for me, I've always been on Team Money. I'll tell you why, and why the Team Love guys got it wrong. Marina states that money can't buy you happiness. What an unoriginal thought. I disagree with the idea that money cannot buy happiness, and I disagree that this is even a relevant argument. The question is “What is more important to you?” It is not “What gives you happiness?” Unless you believe your personal happiness is what is most important in life, but those of us with, ahem, higher purposes in life see past such selfish, low-level animalistic desires. That said, I am still playing Market Crashers, the 3DS StreetPass Mii Plaza game. You get an achievement for 1,000,000,000 G, and the game encourages you to get to 10,000,000,000 G to get the last in-game reward of a massive 24-carat gold statue of your Mii. As of publishing, my total assets are 267,709,010,350 G (or a little over a quarter-trillion) and I regularly get billions of G per trading sequence with my massive batches of Poseidon Island Fisheries stock. I'm acquiring absolutely massive stockpiles of wealth and there isn't enough to actually invest it in, so it's all in cash. It makes me happy just to sit on money. I have a strong affinity for money. If the KoopaTV Loyalty Rewards Program can be used to try to assess me as a person for hosting it, I also like giving away money. Gives me my kicks. Of course, money can be used as the means to many ends, including happiness-generating ends and survival-sustaining ends. Its versatility, as I'll get to in Argument Three, is very important for happiness. I will say, however, that all of the happiness-generating benefits of giving cash as a gift (cash is the BEST gift) are a result of, you know, money. Marina insists that if you don't have love, you won't be truly happy or fulfilled. That's quite narrow-minded. Marina is dead-wrong on this. You do not need love to live a truly happy and fulfilled life. Loving affection for someone (and someone feeling that for you), which is where Marina is going with that, is just one of many paths to be happy and fulfilled. The idea that love has a monopoly on that is crazy. I think Marina is trying to push her lifestyle of hopeless romanticism on everyone else. There are plenty of other ways to get happiness. Ever heard of power? Achievement? Pleasant moments? Volunteerism? Your life can be full of meaning and joy that does not have to come from love. Love does it for some people. It doesn't do it for me, and maybe not for many people reading this. ...No. Money is not the root of all evil, and whenever people claim this, they reveal that they are just not very good at thinking. 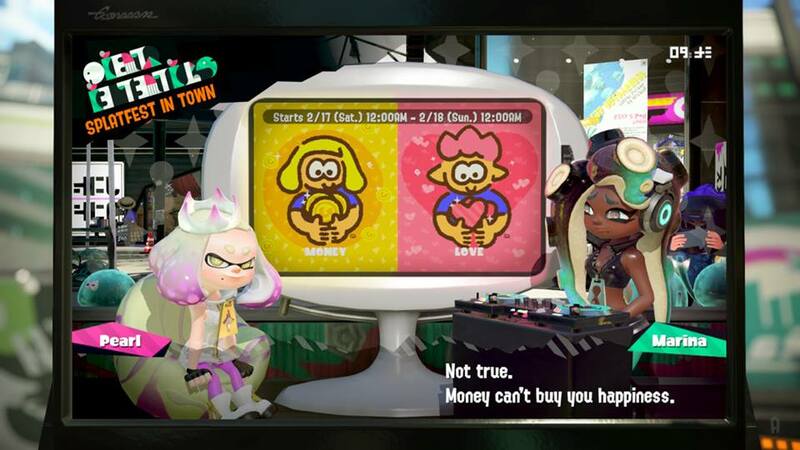 Fortunately, Marina didn't make this argument during the Off the Hook newscast. Consider this. People say that money cannot buy you happiness, and that money is just a means to an end and that money itself doesn't give you anything. Those same people will stupidly state that money in the root of all evil. How can money be a means to an end while simultaneously being the cause of all problems? To be consistent, you must acknowledge that money is a means to evil, just like a means to good. That means money itself is not to blame. That said, since the question is “which is more important”, and evil is pretty important in the world, then money obviously is the correct answer if money being the root of all evil is true. Just so you understand, any economic historian will tell you that the invention of money was one of the enablers of prosperity. Bartering sucked because every economic transaction ended up being a fetch quest instead of being streamlined. Once money was invented, people could actually trade together in a civilisation, which was what allowed better living standards and villages and families and stuff. Then you can get your love, along with many other stuff. Without money, nothing else going on right now would really be possible. If people just kept to their caves or their sustenance farms being in love in their own little world, there wouldn't be an Internet and you wouldn't be reading this. Money is important, people. Besides, I could easily argue that love is the root of all evil. Mario supposedly loves Princess Peach, and that so-called love is his motivation for committing genocide against the Koopa race, and other races too. No money involved there. Without a doubt, money is more important than love. Money is underrated by a lot of people, and love is over-romanticised. Ludwig has wanted to use an Everybody Votes Channel result for a KoopaTV article for several months now, ever since Kamek discovered that all of the results were available online. He was pressured to make a reference on Maslow's Hierarchy of Needs, but whenever Ludwig reads someone using that in an article or a lecture, he screams in rage and starts attacking the nearest object around him, so he wished to spare you the same fate. Ludwig doesn't believe that his non-relationship single status affects his judgment in this article. If you have different judgment, feel free to leave a comment, and then feel free to reply to Ludwig's reply and have a discussion. That generous aforementioned KoopaTV Loyalty Rewards Program will kick in if you're not anonymous. For comparison, during Halloween 2015, North America was concerned about Pirates vs. Ninjas. Ludwig sided with Team Pirates. The Splatfest directly prior to this one was about Action vs. Comedy. Given the scripture-related comments that Money vs. Love generated, it sort of makes sense that the next Splatfest, Chicken vs. Egg, is entirely scripture-based. I chose Team Love this time because without love I would not be here in the first place. I suppose you could make the same argument for money, but money was not the primary factor in the decision. Also, there are different forms of love besides romantic love including: philia, a deep friendship love; agape, love for everyone; and philautia, love of self. Money is just a form of currency while love is something special. "Money is just a form of currency" well duh. You can't tell me "love is something special" while having your previous sentence be expanding the definition of what love is. The more broad you define it, the less special it is. Money is awesome. I'm an analytical guy. I'm more comfortable with things that can be quantified. Money can be used as a measurement of value and worth. Love is just vague and impermanent and fleeting. Might as well be worthless. Definitely useless. Money will still be there as long as it's not eaten away by a high inflation rate. The definition I was using for "special" in that case meant "exceptionally good and precious" and is not necessarily limited by quantity. Also, the actual quote for argument three is often misstated. It actually is from 1 Timothy 6:10 which says "For the love of money is the root of all evil: which while some coveted after, they have erred from the faith, and pierced themselves through with many sorrows." We've actually had a whole thing in our Discord that has dominated our chat all morning and afternoon about scripture. Rawk and Vortex have brought up that Matthew 19:24 says, "It is easier for a camel to get through a needle’s eye than for a rich man to enter the Kingdom of God." And I was wondering wot the hell that even means, and Kamek brought up something about a window that the camel could eat from, and Vortex wrote up this whole long Scripture-based thing but can't corroborate the window. If you want to be very reductionist, you can say that Team Money should all be on Team Love because of LOVE of money, but I don't want to broaden love's definition anywhere close to that since it clearly would not match the intent of the Splatfest. There are two main explanations for the above verse. First, according to some scholars, the word "camel" used in the verse is actually a mistranslated error that resulted from translating the word "rope" from Greek which in that day was made out of camel hair. To make matters worse, the two words in Greek at the time looked similar when written and sounded similar when spoken. The other explanation is to just read the verse literally. Some say that the verse simply uses Hebraic hyperbole to get the point across similar to Matthew 7:3 which says "Why do you look at the speck of sawdust in your brother's eye and pay no attention to the plank in your own eye?" The other theory which states that the needle's eye actually refers to a gate in the city in which a camel can go through has been discredited by many scholars and is considered to not be the meaning. I'm gonna let Vortex or Kamek (maybe both since they disagree) handle this comment since I have no knowledge of this stuff and have nothing to gain by acquiring it. I'll just say that both of those possibilities hold some water (camel pun not intended!). Jesus was known to use hyperbole, but the Greek words for rope ("kamilos") and camel ("kamelos") were easily confused. Though personally I still fall on the side of "camel" since "kamelos" is what appears in three of the oldest extant manuscripts of Matthew. There's also evidence suggesting Matthew originally compiled his Gospel in Hebrew and, if so, may have personally translated it into Greek. If that's the case, since he was present when Jesus gave this illustration, he'd know what Jesus meant and would use the correct term. ...Or maybe Jesus was simply implementing a bit of wordplay. Who knows. You can't thread a rope through the eye of a needle any more than you can a camel, so I don't see what practical difference it would make. Money is abundant, yet desired by many, including the CEOs of many companies. Money stresses us out, whether it's to pay our bills or give the perfect gift (you know, money itself). Love? Love is emotional, and quite valued. Without love, whether from enjoyong the presence of parents, storytelling, activities liqke game, or a religion, our meanings diminish. You enjoy writing for KoopaTV.org, right? It's a platform to express yourself and interact with others! If you really wanted to, you could've kept the "Blogspot" part, not do giveaways, and not pay the necessities to maintain the website. Back then, civilizations thrived on trading. Thanks to money, they were able to thrive, because everyone loved money! However, that was then, and now we keep our money with banks and have to afford these college debts. Not to mention the risks of the lottery and gambling, that resulted in a motivation for people to get more money. Of course, the richest people would rather keep their money than share it. Even if they do donate or invest, their cash is such a heavy parachute so why wouldn't they invest? It's a giant game of Monopoly. Disney acquired 21st Century Fox, AT&T tried to merge with Time Warner, and something controversial is happening with Bitcoin. I'll bring up Splatoon 2. Had Marie not put behind her life as a celebrity and left behind Callie, who knows how long her hypnoshades would've taken her over, to the point of her not being Callie. It's clear that Marie valued her cousin Callie more than being a Squid Sister, although it did caught her off guard when Agent 4 didn't identify her. Also, some of my favorite stories involving love includes La La Land and Coco (family love). As a side note, your arch nemesis lives BECAUSE of money, moreso than love. For every hundred coins, he gets a life (actually ten in Odyssey), a second chance to wrong the rights. My point is, if there were no coins in the Mushroom Kingdom, game overs would be especially more common. Anyway, those are my three arguments. I'm literally a bystander to someone else's drama right now because of a girlfriend and boyfriend having some kind of misunderstanding and some third guy "taking her away" from the boyfriend. Very stupid drama, but that's entirely because of love. Obviously, Love stresses you out, and probably far more than money. Economies STILL thrive on trading. As you mentioned, rich people invest their money. Those investments are all in the form of trading, be it the stock market or bonds or venture capital or assets or wotever. You say "Back then..." and then mention the lottery and gambling now, but the lottery and gambling in general aren't new concepts. They're as old as money. So were banks. College debt is new, but debt in general ain't. Back in the day, there was debt slavery where you became a slave to the dude you were in debt to. That's the source for a lot of the American colonialists, actually. I'm not really sure how your argument two makes sense, because you didn't exactly disprove how important money is right now. If you want to talk about the best stories, we already had multiple Splatfests on genres. Love stories are all about stupid mush and feelings and wotever. Money stories are about pinnacles and achievement and inspiration. Your side note is the most compelling thing here.